Postcard-pretty Samui conjures up images of palm-fringed shores, turquoise waters and rugged coastlines. It’s the sort of destination holidaymakers think of when they’re seeking out a relaxed tropical getaway, with little else to do but to kick back and relax, and enjoy the wide-ranging amenities that a luxury holiday home has to offer. But there’s more to the island beyond the beach; waiting to be explored are cultural attractions, offshore islands, viewpoints and more. Take your pick from oceanfront Samui villas hugging close to the shorelines, or holiday homes nestled away in a lush, hillside setting. Whichever you choose, the essentials remain the same: sparkling infinity pool, tropical garden, impeccable service and a full range of amenities. We offer a wide range of properties to suit different needs - from intimate one bedroom villas for romantic retreats, to spacious, kid-friendly estates made for accommodating family getaways. The coastal towns of North Samui are some of the most popular destinations on the island, for good reason: there are plenty of amenities near the beach, you’re within proximity to iconic cultural attractions and the vibes are vibrant, yet relaxed. The main towns in the region are Choeng Mon, Bophut, Big Buddha, Mae Nam and Bang Po; each has its own highlights, along with offering easy access to family-friendly beaches, restaurants, shops and lifestyle establishments. The main draw in North Samui is the Big Buddha. In fact, it’s the island’s cultural landmark, with a golden, 12-metre seated Buddha statue that can be spotted miles away. Just a skip away is Wat Plai Laem, a colourful temple compound known for its 18-arm Guanyin statue. Fisherman’s Village, a hub featuring cafes, pubs, restaurants and boutiques makes a great all-day dining spot. Need a change up from the beach? 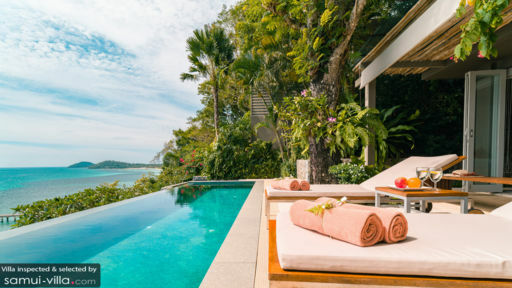 Go stretch out on a mat at The Yogarden Samui, learn to cook Thai dishes at Island Organics, browse the stalls at Fisherman’s Village Walking Street or unwind at Anantara Spa. Located in East Samui are the towns of Chaweng, Lamai and Hua Thanon. Chaweng and Lamai may be widely known party hotspots - but there’s more to these places than beach parties and late-night revelry. Travellers across ages will enjoy the myriad attractions and amenities in the region, which include cultural sites, viewpoints and lifestyle establishments. Check out Hin Ta and Hin Yai Rocks, Wat Khunaram, Lamai Viewpoint and Lad Koh Viewpoint. Secret Buddha Garden may require a longer drive, but is well worth visiting for its serene ambience and collection of unusual statues. Chaweng Walking Street offers a great family experience, with plenty of stalls for villa vacationers to discover the local street food and shopping scene. 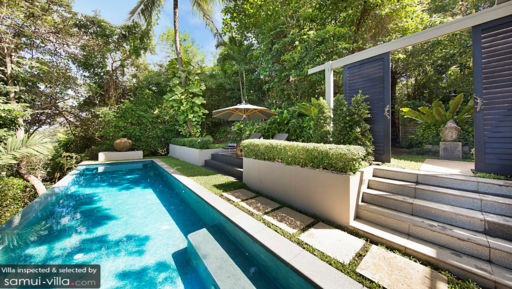 Other amenities nearby include Yoga House & Spa, Lamai Thai Cooking School and Tamarind Springs Forest Spa. Life in the southern and western regions of Samui is slow, unhurried and laidback. Lipa Noi, Nathon and Taling Ngam are the main coastal towns in West Samui. Here, vacationers spend their days relaxing by the beach (the sunsets are spectacular), enjoying decadent Sunday brunches at Nikki Beach Club or hopping off on a speed boat to explore offshore attractions like Ang Thong National Marine Park. In South Samui, it gets even quieter and feels more remote. But that only adds to the allure of the destination, which draws in holidaymakers seeking respite away from the bustle of tourist-populated venues elsewhere on the island. 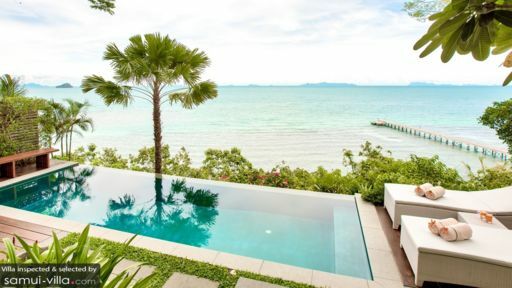 Villa vacationers typically reside in Bang Kao or Thong Krut, taking in the area’s serenity and unspoilt surroundings.